McLay Boats are built tough in the South Island of New Zealand. BEING located in the south of New Zealand’s South Island speaks volumes for the toughness of McLay Boats. This is a region of variable and mean weather, big swell, high winds and cold; where an offshore manufacturer has to produce quality product if they expect to last long in this competitive boating market. From what I can see, McLay boats are more than up to the task. They may not be as well- known over here, but given the build quality and pricing, I expect in the future they will be giving the more established NZ manufacturers a run for their money in short order. Thanks to Mark Luttrell and the crew at Coffs Harbour Marine, I was able to recently test run two McLay boats. McLay boats are manufactured from plate, they have a sharp entry point under the bow that makes for a comfortable hull that cuts through the water rather than bouncing across it; the ride is further enhanced by the weight of the plate. In any sort of messy surface, the ride is a smooth one. However, sharp hulls are not stable hulls particularly when they are at rest, which McLay have overcome through the incorporation of a reverse chines through the 5 mm hull. It’s a combination that’s right on the money for ride and stability. Mark’s a keen angler who gets on the water at every opportunity. He’s also on the organising committee for Coffs Harbour’s Dave Irvine Snapper Competition, so when I noted that the boat we were testing was his own personal boat, I was impressed. This boat is a mid-sized fisho’s boat that has the weight and strength required whilst still being comfortable with beach launching and retrieving, which Mark did the day before the test! The 571 Sportsman is a cuddy cab serious fishing boat with plenty of dry space, a cabin hatch for anchoring a wraparound Perspex screen for protection from the elements, ample dash space for electronics and personal items and two swivel seats. There’s plenty of deck space behind the cabin and the gunwales are wide enough to sit on. All of Mark’s boats come with “level flotation” (gunwales filled with HD foam) as standard. The 571 has 3mm top and sides and a 5 mm bottom (with additional wear strip) and a 4mm welded checker plate floor for positive buoyancy. It has plenty of room to fish and offered a smooth and stable ride. Rod holders are welded onto the gunwale and the low front screen gives ample protection for electronics and personal gear such as wallets and phones. The battery is protected behind on of the two transom hatches with the second holding pumps and providing waterproof storage. Mark has included the following options because they suit his fishing style and improve safety: 130 L underfloor fuel tank, lined dash and half deck, removable bait board (again, a nylon slide) and large live bait tank with a Perspex panel (to keep an eye on those sometimes-so-hard-to-get livies), at a glance. The rocket launcher is a cracker, being very solid and up high enough to be relatively out of the way and dry for those expensive rods and reels. He also has a transom door that operates on a nylon slide whereby it is slid up and out when the door is needed…it’s a design that almost completely eliminates the splash-back common with hinged rear doors. His trailer was well set up and strong. The multiple roller system made it straight forward to drive the boat onto the trailer, even on a day when the notorious Coffs boat ramp has a little side swell hitting it. The quick connect lever clipped the boat onto the trailer as soon as it touched the bow and we were being driven off the ramp by the decky who didn’t even have to get out of the car and get his wet feet! The 591 HT is the largest boat in the Sportsman range. 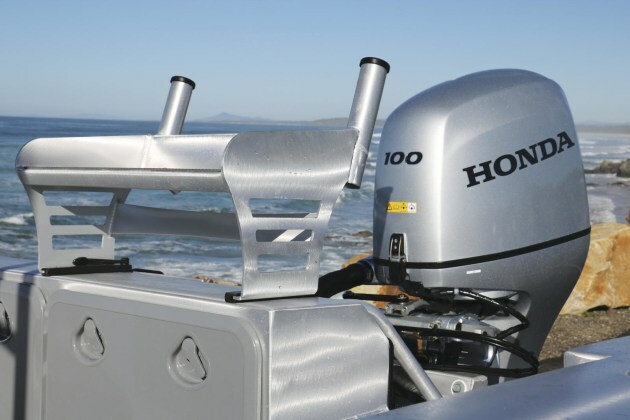 The 591 HT is the largest boat in the Sportsman range. The hull design is similar to that of the 571. Sides and top are 3 mm thick, the floor is 4 mm welded checker plate and a 5 mm bottom. This is a boat that provided full protection from the weather and is ideal for larger inshore waterways as well as locations wide of the coast. Inclement weather becomes less of an issue given the cabin, size and build quality. When testing this boat, I expected it to be larger than it was as the performance is indicative of a 6.5 m-7 m vessel. I was surprised that a sub-6 m (albeit only just) could perform as well as it did. Which means that the 591HT is a real contender for anglers wishing to travel longer distances or fishing for longer periods will appreciate this boat. 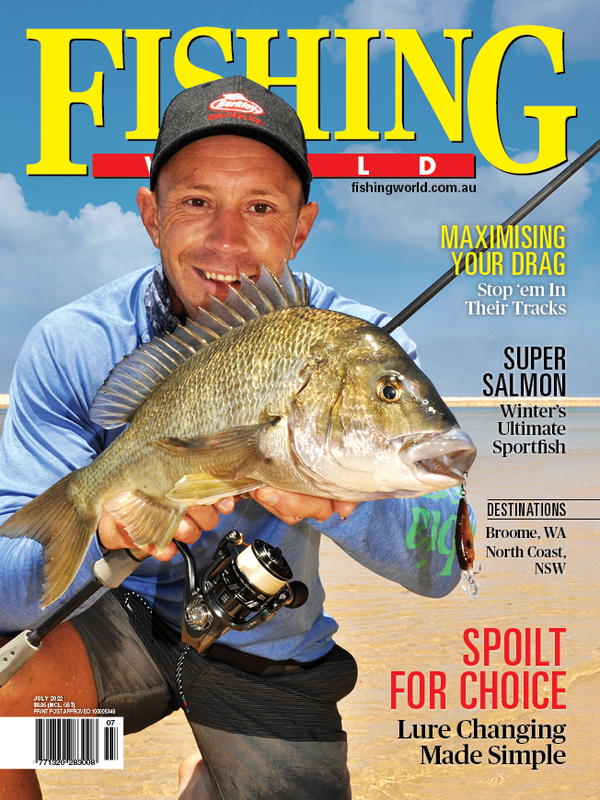 Game fishermenwho tend to be on the water all day or QLD anglers that venture wide to their favourite reef for a day or two will favour a boat of this style. Southern NSW and VIC tuna chasers should also look closely at this boat! For more details, contact Mark Luttrell: mark@coffsharbourmarine.com.au or phone: 02 66524722. McLay boats are designed for anglers.